Pierre is a love. He is a bigger, very strong and sturdy iggy. He loves people, children and other dogs. I have not had him around cats. 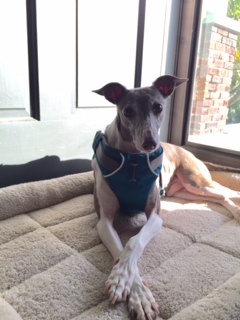 Unlike our other two Italian Greyhounds, he has a stomach of steal, so there is no worry when trying new treats or introducing new food. He loves affection and wants to be with his family at all times. Often he lies at my feet on a mat while I am cooking and doing dishes. He wants to cuddle but also enjoys his crate for napping and nighttime sleeping. 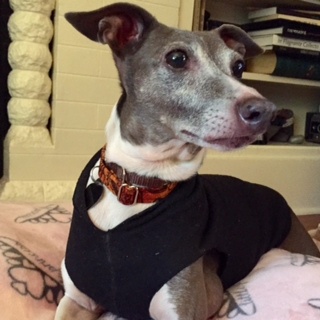 Pierre needs humans who will take him on daily walks or trip to the dog park so he can burn off some of his energy. Pierre is very food motivated and is a quick learner. We don’t think he was taught too much by his previous owners but is highly receptive to learning. So far he knows, sit, down, lay down, no, stay and paw. We are working on “come” and “leave it”. He has made huge strides with walking on leash without pulling. Again, it’s doubtful that he was shown boundaries or taught manners but we are very pleased at his progress. He’s great with our two very small iggys. I think he wants to play with them but they prefer to sit and relax rather than play with any dog. So for the most part they give each other morning kisses and peacefully co-exist the rest of the day. Pierre tends to follow the lead of the more dominant of our two iggys when we are out walking on leash. He is great at the dog park, very passive with other dogs. He loves to sniff and approaches other dogs with manners. Because he is a sturdier fellow we don’t worry about him meeting bigger, more playful dogs, which makes the dog park really enjoyable. We think Pierre is the perfect family dog. He does beg for food, and will check out the garbage can or counter tops for food. We have been working on this and now with direction he’ll lay on a mat until I am ready to feed him or if I instruct him to his kennel he will go there. He has gotten so much better with time so I feel like this behavior could be changed. Pierre is crate trained and is good about going outside to potty. He has had a couple of accidents when I wasn’t watching. Pierre, like most iggys, doesn’t like the cold weather but if he is dressed appropriately he is fine. Pierre is a beautiful, affectionate and strong dog that would thrive in a family with boundaries and the patience to guide him. I have watched him blossom so much the last couple of months, I can only imagine the dog that he will become in his forever home. He has added so much life to our house, it will be hard for us to say goodbye! 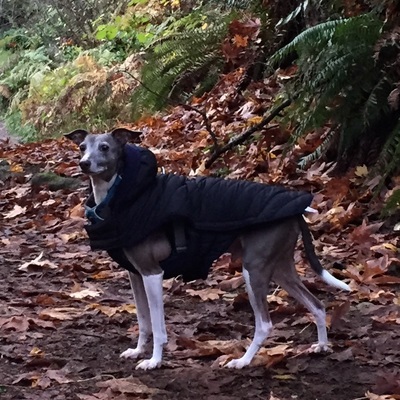 Pierre is being fostered in the Seattle, WA area. Washington/Oregon residents who want to begin the process to adopt an IGCA Rescue dog, please email us at igrfadopt@gmail.com to learn about the IGCA adoption process and receive an application, which may also be downloaded here: Download IGRF Rescue Application . We are always willing to consider placing a dog out of state, but applicants are asked to apply to and work with us through their local IGCA Rep.